For even more recipes, including many of the formulas we use at our clinics, please check out the Herbalista Toolkit. Just a selection of recipes for an herbally indulgent Valentine’s Day! 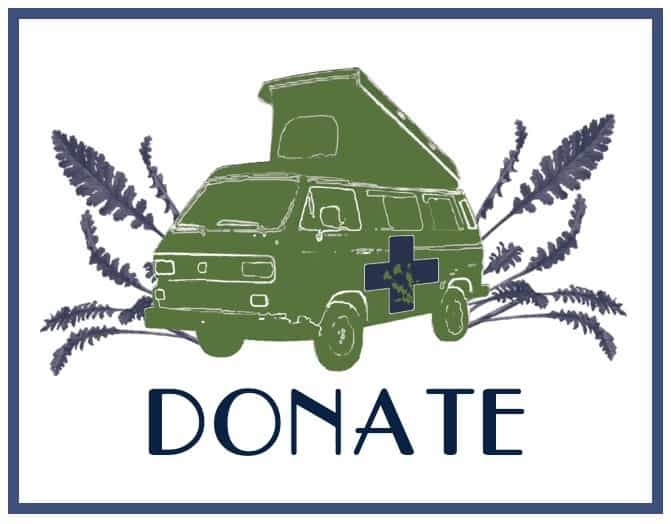 This holiday season, give the gift of health! 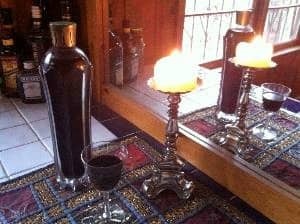 I hope you enjoy creating these healing herbal gifts of spiced pear brandy, syrups, bath soaks, mulling spices and more. The recipe cards are formatted to print out on large notecards. This handout gives basic instructions to prepare a deeply nourishing and immune enhancing soup stock to help you stay healthy all winter long. Bringing healing energy into our creative & social spaces. The long, cold, nights and gray days of winter can leave us feeling a little blue. This tea blend combines the power of herbal adaptogens with warming spices. Adaptogens help our bodies handle to stressful environments, balances body systems, and nourishes us at the deepest level. Tulsi basil is an adaptogen that promotes the metabolism, protects the heart, balances blood sugar, enhances immunity, promotes longevity, and tastes great! A species of basil, it has a spicier and more floral flavor than the common italian basil. Tulsi is also known as holy basil and is worshipped by Hindus as the avatar of goddess Lakshmi. Tulsi grows quite easily here in Atlanta and will last well into the fall. By combining Tulsi with a digestive chai blend, we can warm our hearts and bodies to stay healthy and happy in these final days of winter. **Licorice can encourage sodium and fluid retention. Use with caution if hypertensive. * Blend all ingredients in a big bowl and store in a labeled jar. * Use 1 tbsp per 1 cup water. * Pour freshly boiled water over herb and steep covered for at least 15 minutes. 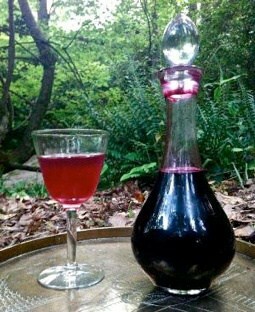 Medicated wines have a long history in herbal medicine. Doctor your own bottle of red wine with delicious, heart healing flavors of cherry and chocolate. * Pour all ingredients into a 1/2 gallon mason jar. * Cap and shake really well to blend ingredients. * Funnel into beautiful bottles, cap, and store in refrigerator. * Serve at room temperature. 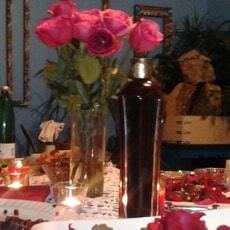 This brandy elixir is simple to make and makes a decadent treat to share with your loved ones this Valentine’s day. * Slice the vanilla bean lengthwise and scrape the seeds into the jar. * Chop the rest of the bean and add to jar. * Add chocolate powder and honey. * Pour in 16 oz French Brandy, cap and shake well. * Shake everyday for 1-2 weeks. One of the first flowers to bloom as winter warms into spring, violets have a long and colorful history. Used in perfumery and many culinary traditions, violets are a beautiful and aromatic addition to most any preparation, whether for body or belly. The violet not only provide delightful aroma and color, but is also high in vitamin C. Last year, about this time, I shared how to make violet ice cubes. 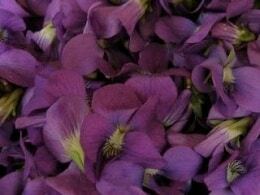 This March we will work the violet flowers into a delicately flavored syrup. The recipe below uses white sugar in an attempt to preserve the gorgeous purple color. But you are welcome to use honey if you like. Please note that honey syrups must be stored in the fridge for preservation. 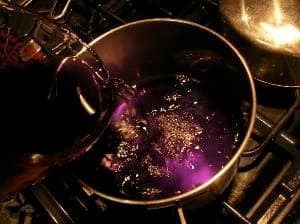 * Boil water and pour over the violet flowers. * Cover and allow to steep for 4 hours. * Strain into stainless pot and gently warm on the stove. * Add 2 oz of sugar by weight for each 1 oz of gorgeous violet tea. * Mix until the sugar is completely dissolved. * Bottle. Shelf stable for 1 year. Harvest the last of the violet flowers and pack them into a mason jar. For every 1 oz of flowers, add 8 oz of fresh boiled water. Steep overnight. In the morning, strain out the lovely brilliant purple infusion and freeze in ice cube trays! The perfect touch to your spring cocktails, adding color therapy, vitamin C, and the delicate aroma and flavor layers violets are famous for. It is the little touches that can make even the simplest offering magical. 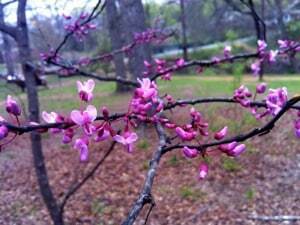 The redbud tree covers itself in delicate pink blossoms before sending out its heart-shaped leaves. These blossoms have a tangy sweetness that adds a vibrant touch (and vitamin C) to a springtime meal or refreshment. No preparation required, just pick and sprinkle! Harvest the purple, black juicy mulberries. To properly ID mulberries in your neighborhood, find a purple squishy mess on the ground, look up and chances are you have found your tree. Wash well and put in a stainless steel pot. Add a touch of water to avoid sticking and burning. Gently warm and simmer until berries soften. Strain through a colander or squeeze through press cloth. Compost skin and seeds. Place back on stove, adding two cups of sugar to each cup of juice. Add a splash to sparkling water, champagne, or a mixed drink. Play with flavors by adding touches of cinnamon or vanilla. Sharaab el Toot click here. 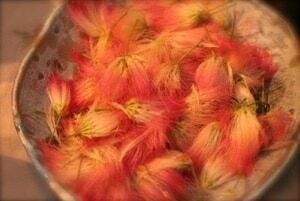 Weigh out 2 ounces of fresh, fluffy, pink fairy duster blossoms and pour one pint (16oz) of hot water over them. Cap and steep overnight. Strain out flowers and compost. Mix with 1/2 part honey or sugar. Stir until completely dissolved. Pour into a beautiful bottle and keep refrigerated. Add a splash to sparkling water, champagne, or a mixed drink for a lovely lift. Mimosa flower is known as “Collective Happiness Flower” in the Chinese Materia Medica. It is nourishing to the heart, both physically and spiritually, and resolves depression. It has recorded history of use dating back hundreds of years in China and was first introduced to America in the 1700’s. Some say it is one of the secret ingredients in Coca-cola. One of my favorite local herbs, it is an abundant and and effective medicine that is pleasing to all the senses. Now is the perfect time to harvest! Click here for more information on mimosa! Instead of sweating the heat, raise your glass and toast it with cool and refreshing Hibiscus. This lovely flower imparts a gorgeous pink color and a tart and uplifting taste to any blend. Hibiscus is loved around the world, both as a culinary treasure and healing herb in places like the Caribbean, West Africa, and South America. In India, the Hibiscus flower is sacred to Kali, the fierce feminine protector of the heart. 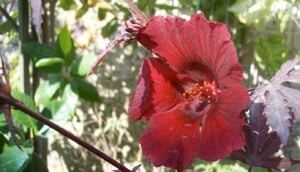 * Steep 1/2 cup of dry Hibiscus Flower & 1/4 cup grated fresh Ginger Root in 1 1/2 quarts of hot water for 6 minutes. * Add 3 oz of Honey, 12 oz of Pear Juice & 1/2 tsp Cinnamon Tincture. * Drink with a spritz of soda & garnish with candied ginger & lime. To read more about keeping cool naturally, click here. Lemongrass (Cymbopogon citratus)is an incredibly fragrant grass that is enjoyed in meals and medicines alike. From Asia to the Americas, its lemony zest flavours Thai curry and Peruvian soup. Ayurveda employs lemongrass to soothes infection and fever. The tea is a aromatic treat, soothing to the nervous system and delicious, whether served hot or cold. In the Lemon Mohini, I’ve used jaggery to sweeten. Jaggery is an unrefined, whole cane sugar used in Ayurvedic medicine. Due to it’s trace mineral content, it is a healthier alternative to refined sugar and also adds a depth of flavor. This drink is an homage to the sweet healing I received from my time spent at the Sivananda ashrams in Berlin and Canada. 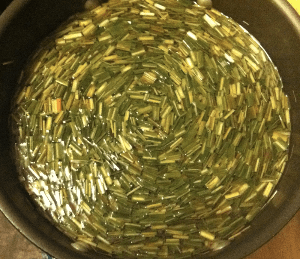 * Make a strong lemongrass tea using 1 tbsp dried herb per cup of hot water. * Pour freshly boiled water over herb, steep for 10 minutes, and strain. * Add 1 tsp jaggery (Sucanat) per cup of tea while still warm. * Drink with a splash of tonic and a squeeze of lime. This summer I experienced life without dairy. For someone whose family actually vacationed on Canadian dairy farms, this is a pretty big deal. But in breaking my routine I’ve managed to stretch my imagination and palate. Browsing the shelves of the non-dairy aisle, I am amazed by the number of alternative “milks” available. Since I’ve always been a fan of almond and hazelnut milks, I thought it was time to try using a local nut. So here’s an easy recipe for making your own pecan milk. It tastes great over cereal, in coffee, and most importantly, to make ice cream! Pecans are high in fiber, protein, and many essential minerals. They are specifically indicated in therapeutic diets when stress-induced hypertension is a concern and can improve overall heart health. The recipe below is a basis for your own flavor exploration– for fans of the coffee flavor, try throwing coffee beans in the overnight soak; if you’re a chocolate lover add cocoa powder…you get the idea! 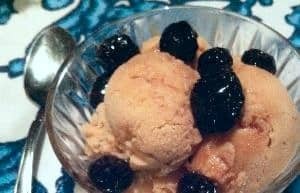 I also tried my hand at turning the mil into ice cream and this photo shows the delicious result– Pecan Spice Ice Cream w/ Brandy Soaked Cherries! * Put 1 cup raw pecans with 2 cups water and 1/2 tsp salt in a mason jar. Close and stick in fridge overnight. * Pour contents of jar into a blender. * Blend for 2 minutes. *For smooth consistency, strain through cloth or mesh bag. *Will keep in fridge for up to 1 week. Hot Toddy with ginger brandy, a squeeze of lemon, cloves, and a touch of honey. As we begin the fall and winter season, it is important to make special preparations for the long, cold months ahead. The winter season places a strain on our bodies and with shorter days and less sunlight, our immune system lowers. Having remedies at the ready, to use at the first sign of cold and flu is the best means to assuring health. 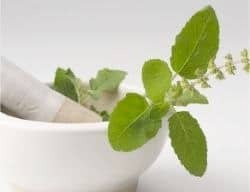 We should use herbs in the early stages of a cold, before it has a chance to settle in and get comfortable. 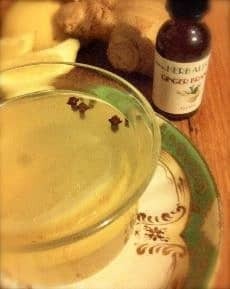 Ginger is a classic remedy for helping the body to throw off a cold. It is warming and stimulating to the immune system. Preparing ginger in the form of a tincture (an alcohol extraction) means you can simply squirt some into hot water and you have an instant tea. And in true herbalista style, it that tastes great! You can add ginger brandy to soup stock, to Winter Syrup or Cold Comfort Tea for an additional layer of healing, or use it to create a deliciously warming hot toddy. The cold weather has arrived, and there is nothing I like better than snuggling in front of the fire with a cup of hot coco. Here’s a delicious recipe for hot chocolate which uses an Appalachian favorite, sassafras root, for a twist. * Place coco powder and pecan milk in crock pot with bag of sassy blend. * When sassy enough, remove bag (around 30 minutes or so). * And add honey, maple syrup and vanilla extract to taste. This herbalista has a splash of german blood in her veins, which means this time of year begs for a little Glüwein. This literally translates as “happy wine,” the perfect name. Here in the states, we call it mulled wine. 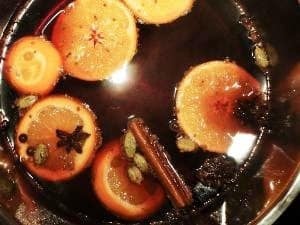 Adding spices such as cinnamon, star anise, ginger, and orange to wine (or apple cider if you prefer) not only creates an amazing flavor but has medicinal benefits during the cold winter months. Orange contains solor energy, so it’s like adding a little shot of sunshine to these dark and gloomy winter days. Most of the other spices such as clove or cinnamon, are anti-microbial, and help stave off winter colds. Mix a jar of this spice blend, to use as desired throughout the season. * Float a muslin bag filled with one heaping tablespoon of mulling blend per quart of cider or liter of wine. * If using wine, you can stir in a little sugar to offset the tannins.